Carolrhoda Books (R), 9781606845967, 128pp. 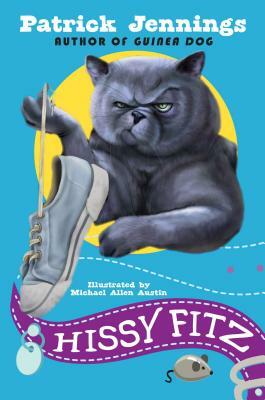 Hissy Fitz lives with some two-legged creatures who are destined to serve him in every possible way and understand his every whim. Sadly, these creatures are sorely lacking in their skills. For one thing--they touch him when they want to touch him. Don't they know that the two-legged are there for him to touch when he wants to--meaning when he wants food? Petting wakes him up They speak to him--don't they know the two-legged should be seen (so Hissy knows where to demand food from) and not heard? It's becoming intolerable. What is this irascible cat to do? Patrick Jennings grew up in northwest Indiana with a bunch of siblings and a book in his hand. He moved to Bisbee, in southern Arizona, where he taught preschool, and later left the desert to live on the coast in Washington State. He travels to schools around the country, speaking to students and parents, and runs a creative writing group for middle-graders. Patrick lives with his daughter in Washington State. Visit his website, www.patrickjennings.com, to learn more, or follow him on Twitter @pjenningswrites.